On January 12th, 2012 I hit publish for the first time on this blog. That means that tomorrow is my 4 year Bloggerversary. My biggest desire back then was to create an income from home in a way that wouldn’t take over our life. I earned a solid, part-time net income in 2015. Some of you might be wondering why am I not earning a full-time income yet. That answer can be boiled down to one word. 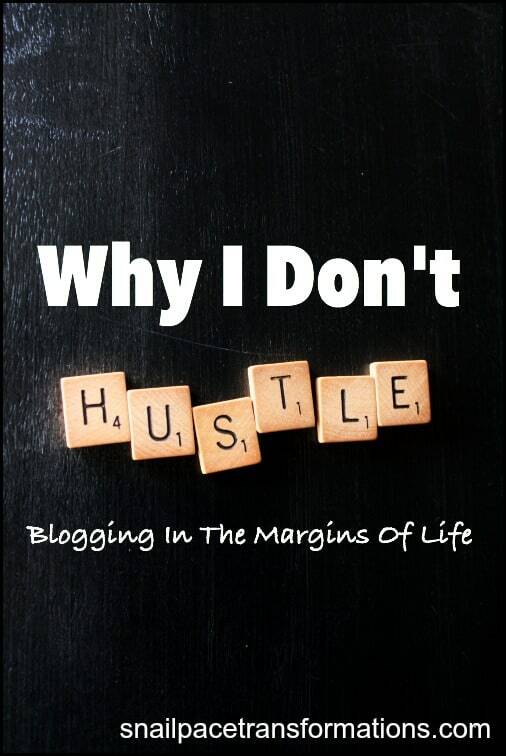 Truth: I don’t like the word hustle–In fact, I would go as far to say that every time I hear it said I cringe. Partly because one of the definitions of the word is “a fraud or swindle.” What honest business person wants anything to do with a word that has that definition? Moving ahead rapidly and energetically with a blog takes time–lots and lots of time. For me to devote that kind of time when I first started (or even now for that matter) I would have had to push something in life aside. But when I considered what, I came up empty handed. So instead my choice was to snail pace my blogging work. Years ago when the children were little, several minor health problems and a few major life events caused me to set life priorities for myself that I simply won’t budge on. Time to prepare good, wholesome foods that fuel my body well. I live by the 80/20 principle on this one. Time to invest in my creative side with reading, knitting, and coloring. I consider a strong marriage the anchor of a strong family and so I invest time in mine. I want to build a relationship with each child as an individual. To do both of the above well I maintain an open door policy, I allow myself to be open to interruptions at pretty much any time of day by my family and my closets friends (I do set some boundaries but they are pretty loose). I take the time to make sure our house runs well; not perfectly, but well. I admit that my time spent doing this has lessened over the years as I have trained my children how to do a lot of the house work. I believe this to be a natural transition. I am training them to run their own homes well when the time comes. I have a few key friendships that I won’t put on the back burner to blog more. These people are dear to my heart and more important than blog growth. I know that messing with life priorities is like messing with dominoes: you bump one and you get a chain reaction in which each ends up falling in rapid succession. Knowing about the domino effect, when I started blogging I wasn’t willing to put my life priorities on the back burner long enough to ignite this blog to its full potential at rapid speed, so instead I grew it inch by inch. Not wanting to let my life priorities slip has caused me to blog in the margins, the little moments in time throughout the day when my life priorities don’t require my attention at such a great level as they need me in others. I blog in the hour after my workout before the children are up for school. The hour after school before dinner has to be made. The hour after dinner before I need to start winding down for bed. I blog on Saturdays when I am not needed to oversee homeschooling (my children are 13 and up). I blog on vacations when everyone is sleeping in but my early bird self can’t. I drive to the coffee shop after dropping my son off at soccer practice, and I stay there and blog until he needs to be picked up. I do sometimes take a blogging retreat of sorts and hide out somewhere to blog for longer periods of time, but those times are rare and far apart. An hour here and an hour there, that is how this blog has been created and slowly through 4 years those hours and hours of work have created a solid, part-time net income without taking more room in my life than I was willing to give. The extra income has allowed our family to do things that were impossible on my husband’s RN wage–even with overtime. This post isn’t to shame those that like to hustle. I know that certain personality types thrive on hustling. If that is you, go for it, but realize your limits. Set boundaries for your work. Make time for health, family, and friends. This post isn’t to shame those who simply must hustle. I understand there are circumstances that create the need to increase your income fast and if that is you, hustle–but make sure to stop when you reach your goal. 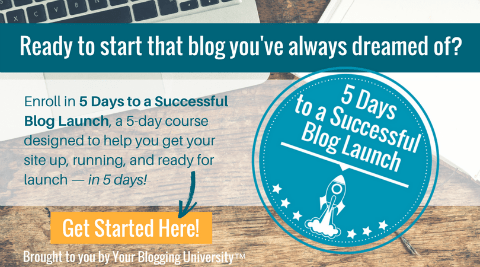 This post is for those of you that feel you couldn’t possibly start that blog or that at home business you have been dreaming of because you simply don’t have that much time to devote to it. It is going to do a whole lot of good! Yes, you will earn less for a greater period of time than those that hustle right out of the gate, but you will be growing something and when it grows, so will your income. Slow business growth is far better than looking back 4 years from now and having done nothing more than thought once of doing it. Slow business growth is better than hustling straight out of the gate only to burn out and then let the whole idea fizzle out. Embrace your snail pace and let your dreams turn become reality! Psst…Want To Know A Secret Of How To Get Ahead Without Hustling? If you really want to start that business, but you are like me and have no interest of living off of 5 hours or less a night of sleep or giving up your daily run so you can work more, there is a way you can fit more work into your day without giving up your life priorities–it is called good time management. There are 3 resources that have been extremely helpful in helping me manage my time well as well as teaching me how to break down tasks into bite size pieces that I can manage in margins of time I find to blog. 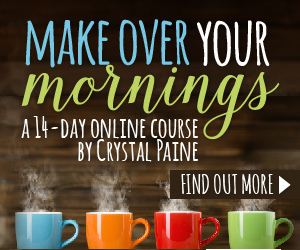 If you are looking for a quick and easy way to consume time management advice, I recommend grabbing the Make Over Your Mornings Course by Crystal Paine. Don’t worry, she isn’t going to tell you how early to get up. She goes through how to set your day up for success by using the first few hours of your day well. The course is broken into 14 videos and 14 printable workbook lessons. Each day takes about 15 to 20 minutes to do. You can take 14 days to do it, or more, or less. It is up to you. Apply the time management wisdom within the course and you will find more margin in your day to pursue your goals. 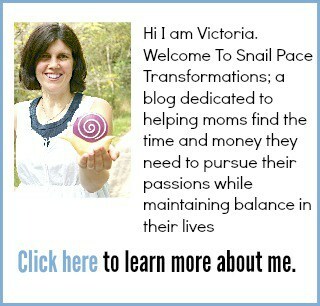 Follow Victoria @Snail Pace Transformations’s board Goal Setting & Time Management Tips on Pinterest. I love this! Sometimes it is important to remember the important things. And, in reality that is not blogging!! Your welcome! You are just the type of mom I wish to encourage with this post. Little blocks of time used well can add up to BIG things in the blog world if you are patient and keep at it. This is a great post Victoria. I love how people balance it all and you do. It is admirable. I also appreciate the warning of the costs. My children are young. Very young. And need a lot. I am thankful that at this point I don’t feel the need to blog new content all the time, or work as much. I still have room to improve in the time designated for work, but it is getting better, and I even earned a small full-time income in 2015. Katelyn you are doing awesome! Congrats on your great year. Victoria, I think God brought me to your blog today because I really needed to read this tonight. I’ve been spending much more time than I intended on my blog and my most important priorities have been slipping. Thank you so much for sharing! I really enjoyed it! It is so easy to spend more time on blogging than intended as the work is never done! I really have to set limits with myself. I love the flexibility of blogging – you can blog more when time allows and less when the day is busy with other priorities, but that is also what gets me in trouble sometimes, you can work on a blog almost anywhere and anytime! Wonderful, encouraging post. Thanks and keep up the great work. You are appreciated. Your welcome. I agree blogging is one of those jobs where boundaries are hard to set, but oh so necessary. Great post! As an older, empty-nester wife and mother, I totally endorse less hustle! We can’t be all things to all people at all times (or do all things either). If you have and keep your priorities straight, the rest falls into place. Thank you so much. I needed this today and will be sharing it with my working mom’s group. I am sure a few more will be encouraged by it. Your welcome and I hope your group is encouraged by the words within the post. I came across your blog from some of Crystal Paine’s Periscopes that she has mentioned you in, and am loving your blog and perspective. 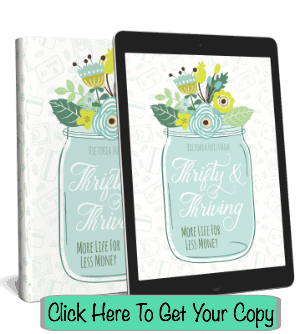 After reading Crystal’s book, Money Making Mom, I was more motivated to be the money SAVER than the money maker in our family which my husband fully supports. I realized that I have a lot on my plate already as a mom and wife. I don’t want my priorities/responsibilities to suffer while trying to earn an income from my blog. Your words are a great encouragement when it seems like there are so many people saying that bloggers should be making full time incomes no matter what the price. I too was more of a money SAVER than a money MAKER in our household for years & I think both are equally important to the success of a household. When I was in that stage I would often tally up just how much my efforts were saving us. It helped me see that in a way I was bringing in an income by making our income go further.